Posted under Library, Reference Question, Resources on Saturday, May 31st, 2008 at 7:34 am, by Brian Herzog. Post and comments available via the RSS 2.0 feed. Both comments and pings are currently closed. Ha – I think my favorite was the guy who called/wrote NPR and said “To save gas, I’m moving in with my girlfriend. She lives 340 miles away.” It could be a new campaign – Shacking Up for the Environment. But I’m curious, after reading the EPA’s recommendations – I have a 6-speed manual transmission. Obviously both 5th and 6th gears are overdrive, but does driving in 6th gear really provide any substantial benefit over driving in 5th? These links are cool. 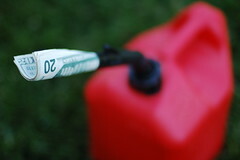 Definitely the post for everyone who wants to save money on fuel to learn more about the tips.